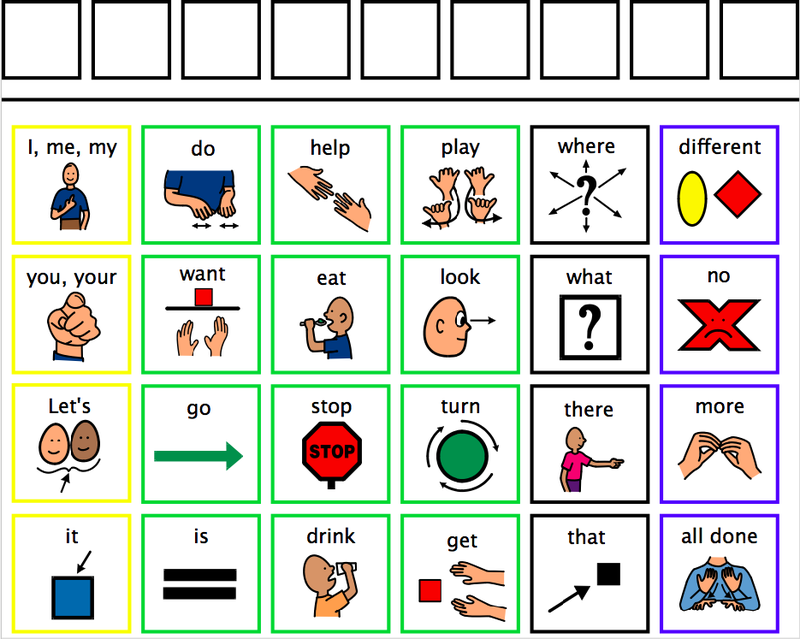 Augmentative and Alternative Communication (AAC) is any form of communication that supplements or replaces speech. AAC can take many forms, from sign language to facial expressions, to printed communication books to high tech speech generating devices (SGDs AKA “talkers”). 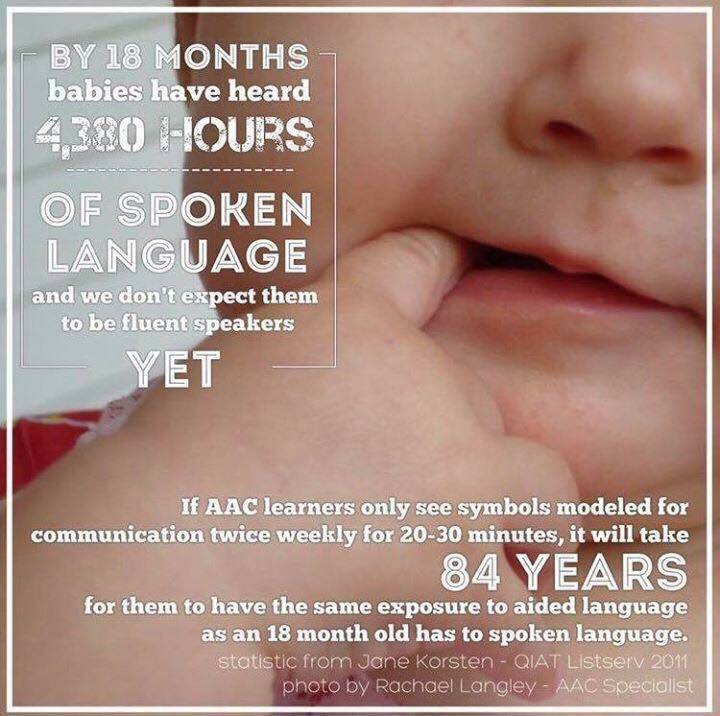 Basically, if it isn’t speech it is AAC! High tech does not always mean better and just like study habits and treatment plans, what works for one person might not work well for another, even with the same diagnosis. AAC users are of all ages, genders, races, disabilities, and literacy levels but they all have either no speech, speech that is difficult to understand, or have trouble forming fluent speech. Remember that last time you lost your voice? I can almost guarantee you that you became frustrated at least once during that time period. Now imagine that you have an itch on the center of your back and you cannot speak. You’re only given this sheet of laminate paper. You can’t sign, speak, or write. How do you tell me your back itches? Maybe … “I/me/me — help — turn…” then directional words until your communication partner happens upon the place your back itches?? Sounds “no want”? What? Not the word you were thinking of? Oh well… good enough. NO NO NO! Everybody should be given access to words (and symbols). Words are powerful and they make us who we are and allow us to connect with others. They surround us from the moment we are born to our very last breaths. Words are more than just basic needs and wants. Words are social, personal, creative and powerful. Nobody should have that kept from them. Be patient! One of the most frustrating things for me if being asked a question and halfway through your response they say something like, “oh, nevermind” or “don’t worry about it”. Similarly, group conversations can be VERY difficult when it takes you longer to respond. I often form my answer and by time I have finished my response is irrelevant. Don’t be offended if I tend to be quieter in groups, I am listening! I know it is hard to take the time to slow it down but I guaranteed you the AAC user will be very grateful! Don’t limit to yes and no questions. It gets boring really quick. That being said, if an answer is needed quickly, it might be helpful to ask yes or no questions or give a few options to chose from. Ex. “Julie, the house is burning and I need to know, should we use: unicorn power, ninjas or rocks to stop the fire. Unicorn power? (yes/no) Ninjas? (yes/no) Rocks? (yes/no) Something else? (wait for response using AAC). Hi Billy, how are you? I saw the Giants won last night! *turns to Billy’s wife* Hi Betty! How are you? How is Billy doing? HI. My——-name——–is———S-U-S-A-N. NIIIIIICCEEEE TO MEEET YOU! YOUR CHAIR IS SOOOOOO CUTE! If you answered #2, wahoo! You get it. Advocate with us and for us! Above: Video compilation project showing AAC users doing various activities and living their lives! Above: An example of a SGD and computer controlled with the users eyes. For more information click here. 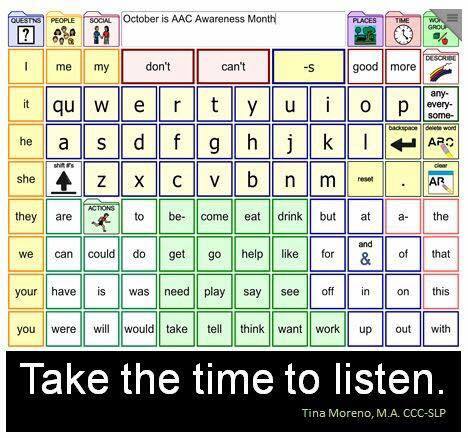 For a great website for AAC resources (use, teaching, awareness) click here (PrAACtical AAC)! Speech-Generating Device: Any piece of technology that turns user inputted text or symbols and turns it into spoken computer generated or synthesized voice. AKA a machine that talks for you. Switch Access: using a switch to control your AAC device (like an automatic door switch). Switches can be activated using touch, light, sound, breath, or even tongue movements!